One medium pomegranate contains 50 calories and less than 1 g of dietary fiber. Pomegranates are also good sources of vitamin A and minerals like potassium. 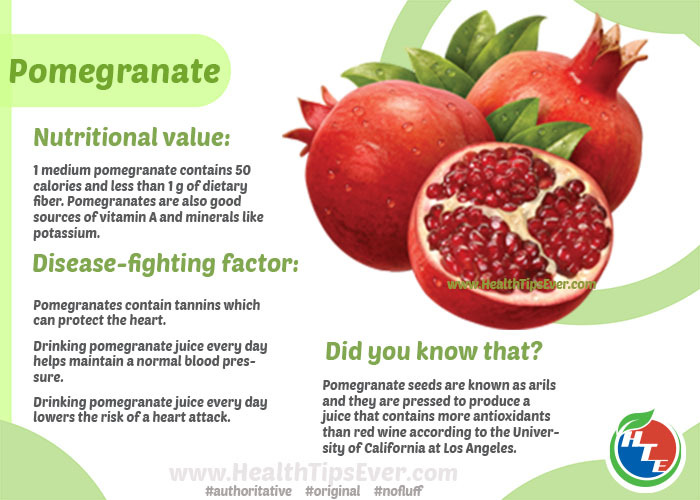 Pomegranates contain tannins which can protect the heart. Drinking pomegranate juice every day helps maintain a normal blood pressure. Drinking pomegranate juice every day lowers the risk of a heart attack. Pomegranate seeds are known as arils and they are pressed to produce a juice that contains more antioxidants than red wine according to the University of California at Los Angeles.